Google released the first stable Chrome 13 build a week later than originally planned. Chrome 13 brings print preview for Windows and Linux, page prerendering and partial URL matching in the address bar. Print preview uses the built-in PDF viewer, so it only works if you use the default settings and you haven't enabled Adobe Reader's plugin. Unlike other browsers, Chrome doesn't have a separate menu item for print preview and there's no modal window. When you click "Print", Chrome opens a new tab that shows the page converted to PDF and a small number of options for printing. For more advanced options, click "advanced" to open the native printing dialog. Since Chrome automatically generates a PDF file, you can easily save it by selecting "Print to PDF" from the "Destination" drop-down. Prerendering extends an old Firefox feature called prefetching. Instead of only loading the HTML code of a page, prerendering loads the page and all the associated resources (images, scripts, CSS files), while also running the active content. This is useful if it's very likely that the visitor of a page will go to another page and it makes sense to load the second page in the background. Google is the first site that uses prerendering. It loads the top search result if it's very likely that users will click it (e.g. : for navigational queries like [CNN], [Princeton]). Any developer can use prerendering by adding rel="prerender" to a link tag, but it should be used sparingly. Another new Chrome feature improves the address bar by adding support for partial URL matches in your browser history. This means that you can type "web" in the address bar and Chrome will match "http://picasaweb.google.com" if you've previously visited the page, just like in Firefox. "The omnibox, Chrome's combination search box and address bar, has gotten much smarter in the latest release, making it even easier for you to get back to pages you've visited before. Just type part of the page's address or title and look in the dropdown for matching pages from your history," explains Google. Chrome 13 is special because Google offered "$17,000 of rewards" to the security experts who found vulnerabilities in Chrome's code. This is "possibly the best haul yet," mentions Google. Print preview looks great, but since it was implemented in dev and beta it works not so good. When I print to PDF, the output file is ugly as if printed all-graphic in poor quality. When I print to PDF Factory Pro the output is still ugly... I have to click "Advanced" every time and print without preview - this way everything works perfect as before. I do not like chrome. I personally prefer to use Firefox. It best suits me for my use! The development console in this version has many problems. I have to close and open the development tools for it to pick up which element I'm on again. It's not updating correctly. I'm on Mac OSX 10.6... One disadvantage of auto updating... Work today has been a nightmare. Seems chrome will dominate Firefox by the end of this year. Great UI with the print preview - always better to rethink an old feature rather than just copying the ill thought out way someone implemented it in 1996. In the article is the first link to the 'Chrome 13 Build' pointing to the wrong place? 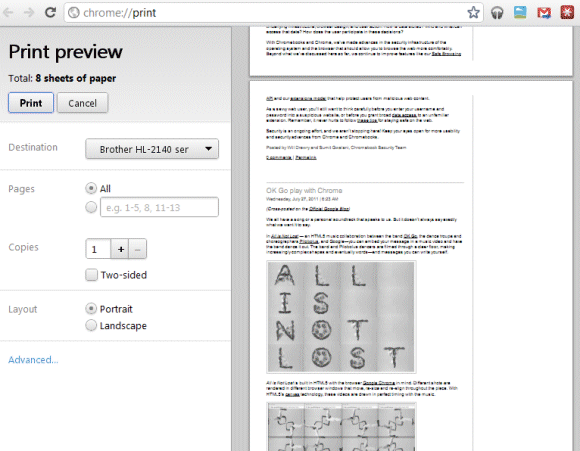 Chrome didn't have a print preview option before today? That's crazy! That's the one option every web browser must have. Releasing it late than planned isn't a problem especially if it made way for improvements that can guarantee the best user experience. Hey, (other) Anonymous, I recommend you file a bug at http://code.google.com/p/chromium. Not familiar with that particular issue you're running into, but you could try using the Canary version, dev channel, or an older version of Chrome in the meantime. http://www.oldapps.com/google_chrome.php appears to have several older versions. I'm stuck with firefox 3.6. I type "ail" in the address bar, and it doesn't give me gmail.com. Even though it's the page that I visit the most! I find Chrome's solutions for displaying my extensive collection of bookmarks to be klutzy, incompetent and effectively unusable in comparison to Firefox or Opera. Both of the latter provide a handy left hand column which displays single bookmarks and folders of bookmarks next to the main browser display screen. I can easily click a selected bookmark and have its page contents quickly displayed. Can't do that in Chrome. The closest Chrome extension splashes the bookmarks listing all over the display screen, often wiping out my train of thought and disrupting my productivity instead of aiding it. If Chrome provided a listing like Firefox or Opera does I would switch to it full-time and leave Firefox's 4 & 5 freezes [like the freeze I get when clicking on a close-tab 'X'] behind me. Chrome is great web browser, whole credit go to Google Current CEO, Who has been Take Big Risk himself to compete in browser industry.